The original idea was to pick white, black, and a grey from somewhere in the middle, but that would work with solids only, all of which I don’t have at hand currently. Here’s a chance to play with monochrome once again, or opposite hues on the colour wheel, or something entirely different! There aren’t many pieces to cut for this block! Another reason for the delay was, and I have to admit this, a really ridiculous splitting up of the background. When trying to figure out the piece sizes yesterday, I had to stop myself and ask why on earth it was so complicated, since the block design is symmetrical. 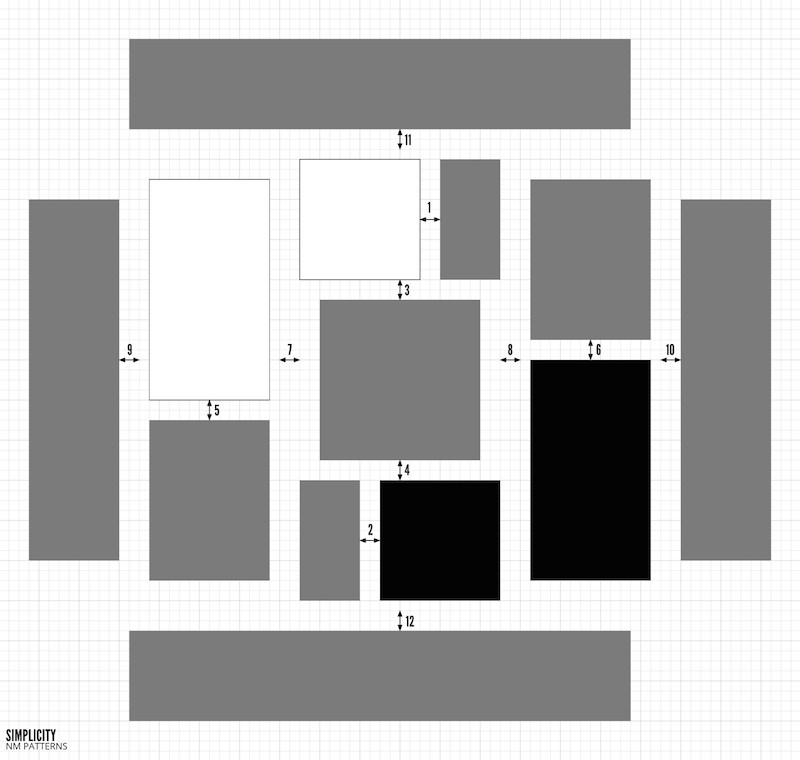 So I scratched the original layout and began from square one. When checking the border sizes, I noticed an error as well. If you look closely at the original design, you’ll see that the left border is slightly wider than the right one. Back to the drawing board… I’m mentioning this to say that there are huge advantages to learning one of all the vector programmes out there, because they come with built-in size calculators and other tools, so instead of drawing by hand, calculating (unnecessarily) manually, and so on, I see immediately the size of a drawn element and can correct then and there. But on to cutting! If you’re using directional prints, please recall that the first length of a piece is the width on the x axis (horizontal), whereas the second one is on the y axis (vertical). If print direction doesn’t matter, as usual, go ahead and cut however is the most logical in relation to your fabric. You could cut a width-of-fabric strip 2.25” wide, then sub-cut into the “frame” of the background, as long as the fabric is at least 43” wide, but please note that some quilting cottons are only 42” wide. Making Opposites Attract is straight-forward, so let’s look at the diagramme. Please click on the diagramme for a larger version, if you need that. The seam allowance is a quarter inch as usual. Quite a few steps you can chain piece, should you so desire, but make sure to lay out all the pieces in their final positions, so you don’t get confused about what goes where. If you want to piece in order, stick to the numbered diagramme, and press all seams open as you go. Here’s my finished Opposites Attract block. It was very easy and quick to make, compared to earlier blocks with lots of pieces, not to mention last week’s inset quarter-circle block. I think it could make a very nice quilt on its own accord, wouldn’t you agree? This entry was posted in Quilt patterns, Simplicity and tagged bee quilt block, modern quilt, Modern Quilt Guild, MQGIM, NM Patterns, Simplicity quilt, Simplicity quiltalong on July 29, 2015 by Nina With Freckles.